CLEMSON, SC - The Tigers are 1-4 in ACC play thanks to a brutal early schedule, and it doesn't get easier with a road game on Saturday at #21 NC State, which beat #7 Auburn earlier in the season. 4 of the Tigers' first 6 ACC games have been on the road, and 4 of their first 6 opponents have been ranked this season. One of the two unranked opponents was at Syracuse, which beat #1 Duke in Cameron Indoor Stadium. 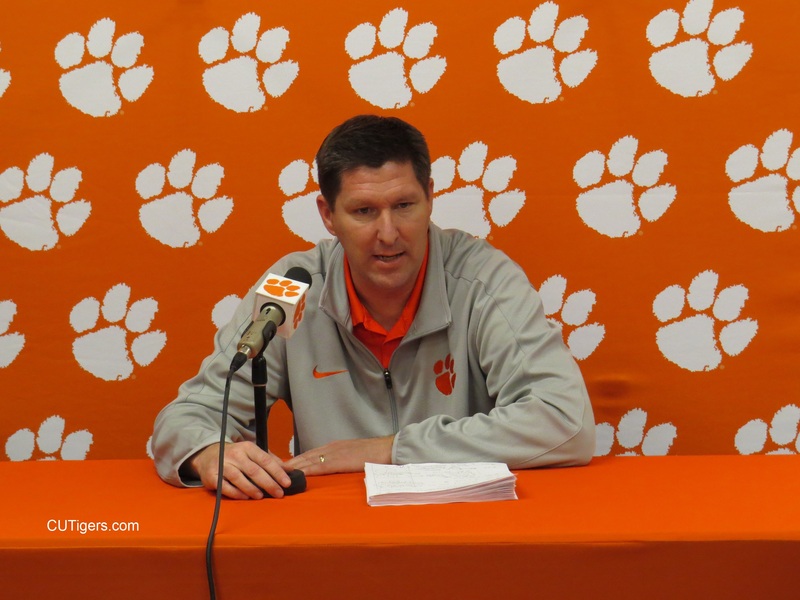 The Tigers have a much better team than their record in the nation's toughest conference indicates, and an upset win in Raleigh on Saturday could really turn things around for Brad Brownell. Brownell seemed to be pleased with how his team fought at FSU on Tuesday night and realized that the Noles just made some shots that they haven't made all season. For example, Nichols was about a 30 percent 3-point shooter this season but went 4-5 from the arc against the Tigers. This will be the Tigers second straight road game against a pressing team, and I asked Brownell about his experienced back court handling that pressure at Florida State. Brownell thought his guards handled the Seminoles' pressure well for the most part. Most of the Tigers' turnovers in Tallahassee came in their half court offense. I also asked Brownell about State's wings and their proclivity to attack the basket off the dribble. It will be important for the Tigers' guards to keep State from getting by them off the bounce, not only to prevent layups but to prevent Eli Thomas from picking up some fouls in help defense. Finally, I asked Brownell about Shelton Mitchell's knee. Brownell indicated last week that he thought the wear and tear of the season is taking its toll on Mitchell's knee, which was a problem for him last year. Brownell thought the long break after last week's win over Tech helped, but that he is continuing to receive treatment and will not do as much as others between games. The full interview with Brownell is below. I'll have my preview for Saturday's game at NC State posted on Friday, and I'll also have baseball interviews with Monte Lee and players on Friday, so stay tuned!